Few people really want to watch a training video. Even if they’re interested in the topic, they may feel that a training video is unnecessary. Employees often feel that training videos tell them what they already know. But unfortunately, training videos also aren’t optional: they’re an incredibly important part of making sure that a business’s operations are handled correctly. So how can you ensure that your training videos are listened to and absorbed? Why should your employees pay attention to your training video? What will they gain? IBM’s Daily Stand-Up Meeting training video focuses not only on a critical process, but also why it’s important. It directly addresses some of the major issues that employees may have with the process, in addition to issues they may have getting their work done or in their day-to-day operations. However, it also acknowledges that these processes are necessary for larger reasons, and that these processes will ultimately make the employee’s life easier. It further doesn’t sugarcoat the process or pretend that it will solve everything. Too often, training videos are only focused on what a process means for the business itself. The business may be concerned about safety, production waste, or productivity. But these aren’t necessarily the concerns of the employees themselves. By going too broad in their goals, businesses may alienate employees from the process of training. By showing employees that the business knows what the employee themselves cares about, they can connect with and encourage their employees. If you’ve followed Moz’s videos at all, you know that their training videos are very rarely posted in long form. Instead, Moz tends to produce short snips of training videos that have a particularly narrow focus. An example of this is their Whiteboard Friday series. Instead of devoting an hour to SEO training, Moz instead produces dozens of shorter clips on very specific aspects of training. This is important. People are more likely to retain information if it’s broken into manageable pieces. Moreover, if the video promises some specific information, they’ll be able to find that information if they need it. Rather than having a comprehensive safety video, a company can instead break a single video into safety information for different equipment or procedures. Consider, instead of creating a single, large video, instead creating a knowledge base that acts as a repository for linked videos. Your employees will still have a complete sequence of training to go through from start to finish, but they’ll be able to finish their training in small chunks rather than having to digest a large volume of information at once. In the LRN #chuckleheads video, a common mistake ends up having comical results. Office etiquette videos tend to be a little dreary, as they’re really repeating things that most people already know: to be polite, to double-check emails, and to never send emails while upset. Yet even though people may already know this, they may not have really internalized it. By adding some absurdity to the premise, the #chuckleheads video becomes automatically memorable. Next time an employee is thinking about sending a particularly caustic email, they may flash directly back to this email—and they may hesitate to send it. Absurdity is memorable, it makes it so that employees will think about the video in the future and consider their actions. It’s also a great way to break through a more boring topic. Even if employees genuinely want to learn, it can be very difficult for them to focus on a topic that is matter-of-fact or dry. In fact, the most boring and simple concepts often need to have the jazziest introductions and content, as otherwise it’s likely that they will be altogether ignored. Dramatizing the event a little and being a little silly about it is a way to lighten the atmosphere and make them more receptive. People are far more likely to retain what they’ve learned if they are tested on it. Rather than just asking them to watch something—which is likely to get them to zone out—you can ask them to interact with the video, too. This keeps them engaged throughout the entirety of the video, rather than just scanning the video for information that they need to retain. 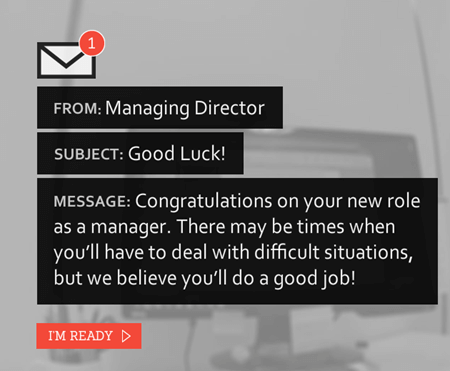 In this example of an interactive, e-learning video, the user is prompted to make decisions to navigate a specific scenario. The decisions the user makes is used to determine their managerial style, in addition to providing advice to the user regarding the decisios that would have been more effective. An interactive, e-learning video aids training by showing users not only what they should do, but why they should do it. It also gamifies the process of learning by making it fun. Interactive training simulations are a good way to test whether the user has retained the appropriate information. At intervals, users can be tested on the information that they’ve received, to make sure that they understand the concepts presented to them before they move forward. Otherwise, users may move ahead too quickly, and fail to grasp foundational information. In order to bring potential customers in, Dechert Law decided that simple advertising was not enough. Instead, to educate people on their services, they decided to tell a complete dramatized story, called “A Price Worth Paying.” Though this was a consumer-focused video, it was still a training and educational video: it was expressing to customers the importance of paying for legal protection. People tend to learn through storytelling. This has been true since the very first fables were written. Rather than just dumping information on an employee, a company can instead create a story about an employee, what they need to do, what they should have done, and the consequences of their actions. Telling a story doesn’t mean you need to produce a 30 minute television show: it just means integrating personalized examples into your training videos can make them more useful and compelling. An issue many employees have with training videos is that they simply cannot see how the training really relates to them. Telling a personalized story lets the employee relate directly to someone within the story, and shows them the importance of the training. In Customer Service vs. Customer Experience, viewers are asked to complete a mental exercise: list five businesses that they’re loyal to. From there, they are asked to explore why they listed those businesses, and what makes those businesses special to them. In this video, it’s intended to train people on customer service, customer experience, and the importance of these concepts. It does so by anchoring the idea of both concepts to the viewer themselves. Asking employees to think about their own situations, what drives them, what their focus is on, and what problems they may have is a great way to frame information. By doing this, you’re asking employees to really think about the information being presented and recontextualize it, leading to them ultimately being more likely to retain the information as well. Employees may also be asked to question their own processes and to identify times when they may not have followed procedure, may have been uncertain about procedure, or may otherwise doubt that they did the right thing. It’s easy to make mistakes—employees should simply be encouraged to think about how they could have avoided those mistakes, and how they can make sure those mistakes aren’t made again in the future. Many people learn more easily by emotion than by fact. In Breathing Underwater, a company focuses on the after effects of compliance-based lawsuits. Though the company could have drilled down into what makes a compliance lawsuit stick, they instead decided to focus on the aftermath of such a lawsuit: instead, focusing on why an employee would want to avoid such a major event. An emotional appeal works especially when it comes to common sense things, such as safety scenarios. While an employee may not want to pay attention to the safety scenario itself, they will pay attention to the aftermath of such a scenario: having to tell someone their spouse has been injured on the job, for instance, or losing an employee to a preventable cause. There are many training videos in which the source information is already accessible through manuals, intranets, and other avenues. In these situations, the training video may need to highlight the importance of learning more about these issues—such as safety and regulatory compliance—rather than going over every aspect of it. The more visceral and relatable the video is, the more it will likely serve its purpose. The best training videos don’t talk down to employees, provide an engaging premise, and are as brief and informative as possible. The more clear and creative your training videos are, the more likely your employees will be to pay attention to them and absorb the information that’s been prevented. Videos are excellent for the purposes of training: there is no other type of media that can be as informative. Putting a little additional work into making the training videos entertaining and will pay off later on.